The world's oldest customer service complaint dates as far back as 1750 BC. Photo via Imgur. While Yelp has only been around for 10 years or so, complaining about customer service has been around for since, well, forever. 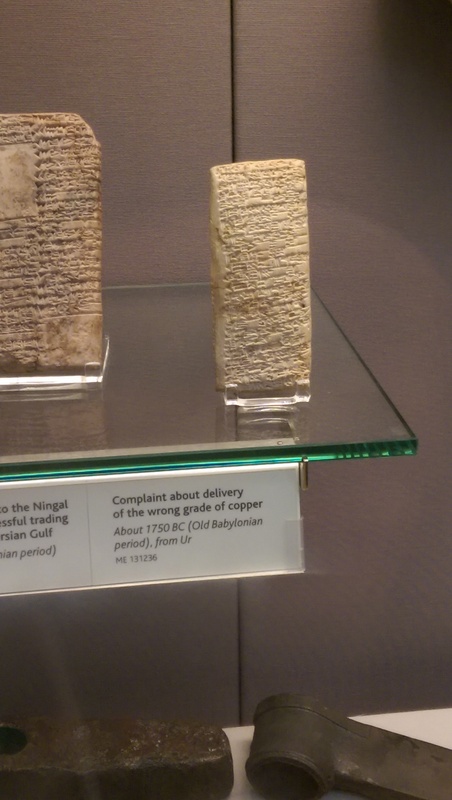 A Reddit user who goes by the name or “tbc34” recently brought an ancient artifact to the Internet’s attention: a Babylonian customer service complaint inscribed on a clay tablet sometime around 1750 B.C. The complaint details dissatisfaction with two shipments of copper ore.
Another Reddit user named “labarna” provided a full translation of the clay tablet, taken from Letters from Mesopotamia by Assyriologist A. Leo Oppenheim. “What do you take me for, that you treat somebody like me with such contempt? I have sent as messengers gentlemen like ourselves to collect the bag with my money (deposited with you) but you have treated me with contempt by sending them back to me empty-handed several times, and that through enemy territory. Is there anyone among the merchants who trade with Telmun who has treated me in this way? You alone treat my messenger with contempt! On account of that one (trifling) mina of silver which I owe(?) you, you feel free to speak in such a way, while I have given to the palace on your behalf 1,080 pounds of copper, and umi-abum has likewise given 1,080 pounds of copper, apart from what we both have had written on a sealed tablet to be kept in the temple of Samas. Read the entire translation here. “F*** netflix. I want to read more passive-aggressive clay tablet arguments from three and half thousand years ago,” Reddit user wongo commented. Redditors quickly turned the comment thread into a long list of other cool ancient finds, like the “bawdy” graffiti of Pompeii — or these (likely annoying) cat prints on a medieval manuscript. “Here is nothing missing, but a cat urinated on this during a certain night. Cursed be the pesty cat that urinated over this book during the night in Deventer and because of it many others [other cats] too. And beware well not to leave open books at night where cats can come,” the scribe wrote. Time doesn’t change everything after all.